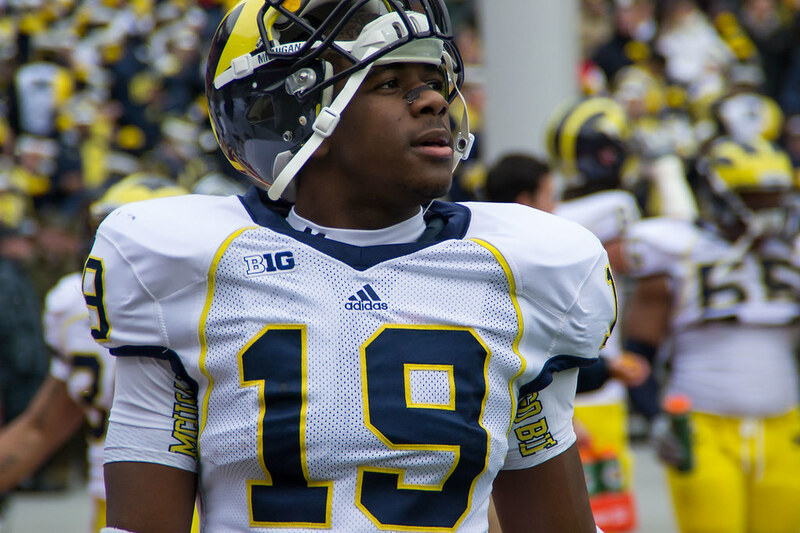 Devin Funchess during pregame at Ohio State. Some universities are taking issue with the way adidas is doing business. ESPN's Kristi Dosh reports. Lost in the chatter about the new uniforms adidas created for some of its partner schools during March Madness: the fact that 17 schools terminated or suspended their contracts with the apparel giant. What did adidas do to raise the ire of so many schools? The issue revolves around the closure of PT Kizone, a factory in Indonesia with which adidas, along with Nike and the Dallas Cowboys, had contracts for the manufacture of goods. According to a report produced by the Worker Rights Consortium (WRC), violations at PT Kizone began in September 2010 when it failed to make mandatory terminal compensation payments to employees who left the factory. In December 2010, the factory failed to make regularly scheduled payments to current employees. The owner of the factory then fled Indonesia in January 2011. Thereafter, the buying agent, Green Textile, ran the factory and paid workers through March 2011. In April 2011, PT Kizone was declared bankrupt and closed. Dosh also notes in the article that not all of 17 the schools that ended their adidas contracts had supplier deals with the company, some simply had apparel licensing agreements – which is common for many universities. According to ESPN's Brian Bennett, Michigan could possibly decide to cut ties with the company – prematurely ending their contract which set to which expire until 2017. The story says Wisconsin has sued adidas and that Penn State has suspended its contract with the apparel giant. Rutgers has already terminated its deal with adidas. But the big one here is Michigan, which according to the story, has the largest college sports contract with adidas, worth more than $60 million. Michigan president Mary Sue Coleman has been requesting frequent updates from adidas on the Indonesia situation. It would be huge news if the Wolverines, one of the most iconic brands in college sports, suddenly became a free agent for apparel rights. (Of course, some would argue that adidas deserved to be fired for this monstrosity, or this, or this. Earlier this month, we addressed some of the superficial issues fans have had with adidas since they took over in 2008. We posted a poll for fans to pick either adidas or Nike as their preferred Michigan apparel supplier. It seems most Michigan fans prefer the swoosh. 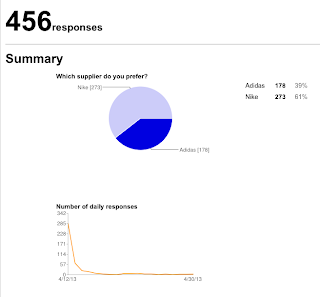 Nike shot out of the gate fast with 90% of the vote through the first 150 votes, and then Adidas immediately closed the gap (I suspect little Indonesian bots). But as you can see, in the end, the vote clearly favored Nike. The thing is, Nike hasn't fared much better in the oversees working conditions debate either. The Nike brand has become synonymous with sweatshops and underage workers, although that doesn't seem to bother many Nike-supplied school's fans. Plus, from Michigan's perspective, the adidas deal is way more lucrative than the Nike one it replaced. So if Michigan cuts ties with adidas, who says they'll return to Nike? Does Nike even want Michigan back? Or vice versa? From what I've heard, there was some bitterness on Nike's end when the split occurred back in 2007. Outside of Under Armor, who I don't think is a realistic possibility, it's pretty slim pickings in the apparel supplier market. Russell Athletic? Reebok? There's really no clear cut answer. It will be interesting to see what happens. But my money is on Michigan sticking with adidas until the contract expires and then let them and Nike duel is out for the next contract. Adidas make cheap,cheesy uniforms that tear at the first tug of a defender. The Michigan brand made its name wearing NIKE. 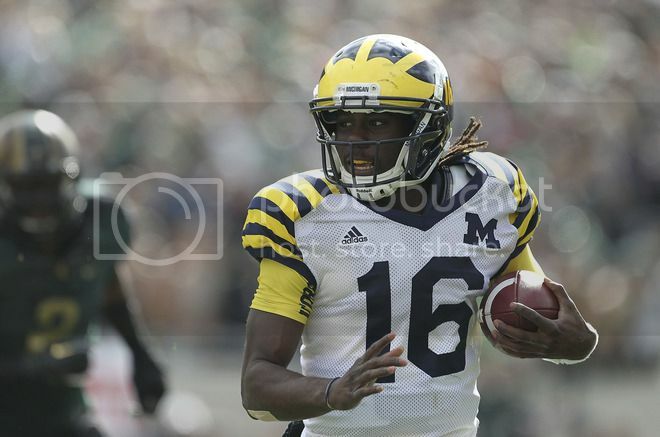 Here's to hoping Michigan reverts back to the Classic Swoosh and puts this Adidas experiment in the basement with Rich Rod.